The 7th Tal Chess Memorial saw a new leader emerge as Italy's Fabiano Caruana beat Vladimir Kramnik (on a blunder mission) in the eighth round in Moscow. This was the second consecutive loss for Kramnik who slipped down in the standings. Another earlier leader, Alexander Morozevich, continued the string of bad results and lost the third game in a row, this time with white against Luke McShane. In the other games, Alexander Grischuk beat Hikaru Nakamura, Carlsen - Tomashevsky and Radjabov - Aronian were drawn. 1. Caruana – 5; 2-3. Carlsen, Radjabov – 4,5; 4-7. 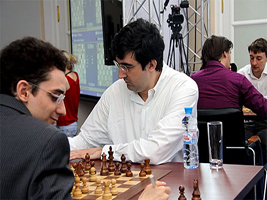 Morozevich, Grischuk, McShane, Kramnik – 4; 8-9. Nakamura, Aronian – 3,5; 10. Tomashevsky – 3. Tal Chess R8: Tomashevsky Does a Clark Kent against Carlsen!